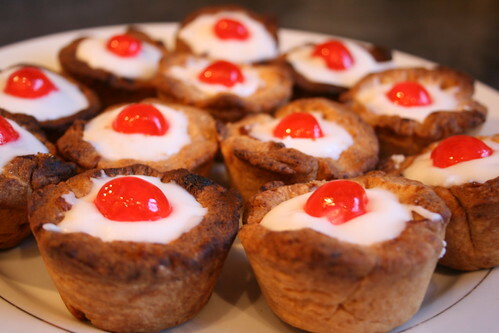 Three years ago today, I proudly uploaded the first recipe I’d ever used my own initiative on — an attempt to replicate Mr. Kipling’s Cherry Bakewells. The pastry was way too thick and they were kind of burnt, but I was incredibly proud of what I’d made. Three years, two new layouts and two new hosts later, here we are. I started She Cooks, She Eats pretty much the month after I started cooking, and I was total crap at it. And blogging. Just look at the photos from that first month. They’re terrible. I like to think I’ve gotten better since then. Better at blogging, yes, but definitely better at cooking. Which is why my recipe for this post is so hilarious. I decided to make some uber-decadent birthday cupcakes. They’d be chocolate on chocolate on chocolate, with a rich buttercream made using real chocolate. So on Sunday I got to work. And ended up with these. That icing is appalling. I had to pat it into place rather than pipe it — it actually split my piping bag when I tried to pipe. And then my attempts at decoration leave…a lot to be desired. And that’s leaving out the ones I tried to spray-paint silver. The cakes themselves tasted delicious, but everything about the decorating went wrong. On Sunday, I was crying with frustration at these. Writing these now, it makes me laugh. I am so proud of myself and how far my cooking has come in three years…but I still can’t ice a bloody fairy cake properly. I’ve got a long way to go. So on Monday I went back to basics and made one of the first cakes I’d ever made — Little Louise cakes (recipe coming Friday). And they were perfect and beautiful, and showed me that even if I can’t pipe, I can bake bloody well. Happy blog birthday to me. I’ve learnt a lot in three years. Here’s to the next three, and the things I’ll learn then. For now, let me leave you with the cake recipe for my birthday cupcakes. The icing didn’t work, but the cakes are delicious. happy birthday, and I’ll teach you to pipe!